We’re finally into double figures of the 30 Day Challenge, a third of the way through. It was originally set in December by Ree at 78 Keys, but today, her question is this: What card best represents you/your personality (or, is most often pulled to represent you in a spread)? 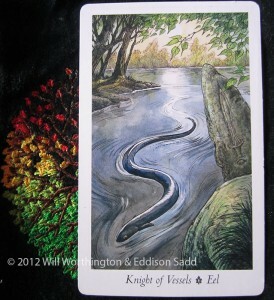 I hinted at this yesterday when I thought about the most popular card I’ve blogged about in 2012 and why that might be. Usually, to represent me, based on my birthday, is the Knight of Vessels, but my age and Sun-sign point me towards the Queen of Vessels. Here on the right we can see the Knight of Vessels. He’s adaptable, fluid. If he needs to get his tail end out of the water, he will. When he needs to go back in, he will and always, he finds his way: somehow. Eels have a great homing instinct, nearly as strong as, or very comparable to, The Salmon, who in this deck, is the Queen of Vessels. She for me, is the calm one, the one who will often jump through hoops for her family, children, spouses, because she loves them. Like the Eel, she’ll get out of her own comfort zone, her own environment, to do what must be done. Yes, even to the point of sacrificing herself, her health (physical and mental) or otherwise for family. But she’s a loving mother, a nurturer, the one you’ll get cuddles from, who will eat the things on your dinner plate (peas perhaps?) that daddy says you have to eat, but mummy knows you won’t touch with a fork the length and size of a barge pole! So, what can these pair bring to us today? For me, they’re adaptable, giving, wear their heart on their sleeves, able to ride the emotional roller-coaster of life. So, which ever-one appeals to you more today, their energy is yours to borrow. That is what the Tarot does: it helps you find the answers you need. And I am here to help interpret the answers from the Tarot.